Andi radios HQ after getting to grips with Wildlands' Bolivia. Ubisoft has never been sequel shy, or bashful about letting ideas and mechanics cross-pollinate between its games. Thus, almost a year to the day after third-person shared world shooter Tom Clancy's The Division first had us blasting our way through the bad men of New York, third-person shared world shooter Tom Clancy's Ghost Recon Wildlands has us blasting our way through the bad men of Bolivia. 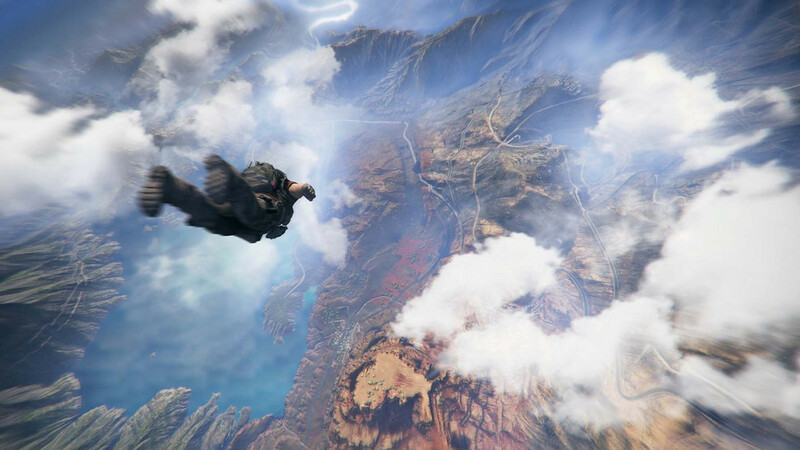 I'm being somewhat flippant, of course: Wildlands is its own beast, something that became more and more apparent after I whet my appetite in its beta. And although that was mere weeks ago, there have been a few improvements made since, including some much-needed work on the cutscenes to fix dialogue cutting out or not animating. Even so, these scenes still have a creepy vibe, like they're being played out by two dummies from a CPR course. But let's start at the beginning. The narrative of Wildlands is simple to the point of cliché, but it gets out of the way so players can just get in and shoot stuff. Bolivia has been overrun by the Santa Blanca Drug Cartel, which now exercises control and influence within government, law enforcement, and media. Apparently that was all fine and dandy until they went and killed an American DEA agent, so now, as a member of an elite Delta Force task group, you've touched down to dole out some justice, 'murica-style, with the ambition of taking the Cartel out of power for good. How and where this justice is doled is up to you and three AI – or ideally, you and up to three other players. Mission objectives are grouped into zones, and culminate in you taking out one of the cartel's sub-bosses. Players lure these bosses into the open by disrupting drug production, supporting local rebel forces, and clearing cartel bases. I'm about seven hours into the campaign at time of writing, and that's been enough time to have fully completed the first zone, and to get about halfway through the second. There are many zones (it's a huge game, map-wise), and my biggest concern at this point is the campaign is already starting to feel repetitive. I'm still having fun though, mainly because there are a huge number of ways you can approach any encounter. Things usually begin with some reconnaissance, and because this is Ubisoft, you can deploy drones and binoculars to tag targets. 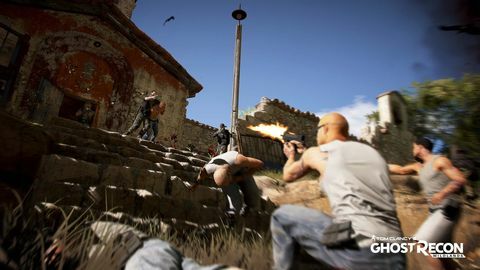 You can then take them out one by one from long range – just don't splatter the brains of an enemy on his mates, or you'll have an army of angry dudes in (now soiled) tank tops chasing you down, and numbers in Wildlands can quickly become overwhelming. Stealthing into a compound, twisting necks and flexin' pecs, is always entertaining too, but sometimes you just wanna go in guns blazing on a motorcycle, or hanging out the window of a speeding SUV with a bazooka and a bad attitude. Your AI squadmates can be given simple orders but will generally stick close, teleporting into any transport you've commandeered despite your best efforts to give them a late night desert cardio session. They are handy though, and will mark targets, sync takedowns, and even revive you. Unsurprisingly, other players bring the chaos, and the entertainment. With flesh friends, you are all free to wander far from each other and do as you please, only coming together when there's enough cocaine to go around, or if someone has found an attack helicopter. One of my favourite moments so far occurred when our pilot failed to fly over a mountain during a hostage rescue, which resulted in a 20 minute walk through Bolivia to get our man back to the rendezvous point. Sure, it wasn't the perfect "get in, get out" encounter that's often possible solo with AI, but it was a far richer experience. One unexpected reason that Wildlands entertains is that it doesn't take itself particularly seriously. It does this in a GTA kind of way – perhaps half unintentionally – with loopy vehicle physics, strange glitches, and weird death poses. Cars can drive up almost any incline if you have the patience (which for some reason always cracks me up), and all handle rugged offroad terrain surprisingly well. The game's juxtaposition of upbeat Spanish folk music with over-the-top explosions is pretty great, too. After the grimness of The Division this is all entirely welcome, and it helps deflect the suggestion that Bolivia is a country run by maniacs who use shell casings for currency – something the actual Bolivia took exception to earlier this week. It's also hard to feel down when looking across virtual Bolivia's plains, mountain ranges, and meadows. This is an expansive, impressively laid out world for sure. It's not all Chorizos and black tea, though. Ubisoft's penchant for minimap icons upon icons is as aggravating here as it is elsewhere, and I'm not a fan of the UI in general – it feels cluttered and confusing. 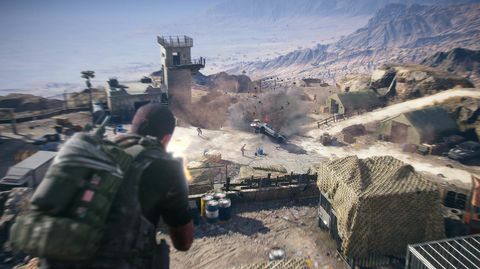 There's also little doubt in my mind that Wildlands is a much lesser game played solo, as so much of its depth rests heavily on its multiplayer element. And did I mention the repetition? There's some repetition. As in, things repeat. Even so, I'm enjoying Wildlands so far, and look forward to crushing more of the cartel prior to producing a full review in the coming weeks. If you want to get down, get down on the ground. Gettin' lit up in Bolivia.